Ernest Samuel Tonks was born in Beeston on the 26th June 1897, the son of Sam Tonks (born about 1860 in Radford, Notts) and his wife Elizabeth (née Cross, b. 1859, Beeston Notts). Sam was a lace maker who had married Elizabeth in 1896, after previously being married to Anne (née Chamberlain) who had died in 1892. In 1901, the family - including Ernest's three older half-brothers, were living at 30 Willoughby Street, Beeston2. It appears that Ernest was his mother's only child. Ernest attended the Nether School where he started on 29th August 19043, leaving on 7th October 1910 to begin employment as an apprentice at the Co-op Grocery Stores in Beeston. Samuel went through his years in the Boys Brigade and continued his membership in the Beeston Old Boys. He was a keen footballer and played for the Lenton Priory Football team. He along with an old school and "BB" friend Bernard Spray enlisted together at a Recruiting Office in Nottingham joining the Kings Royal Rifles in December 1914. The 10th Battalion King’s Royal Rifle Corps were formed at Winchester as one of Kitchener’s new Service Battalions. While in the town of Blackdown, Leamington Spa in Warwickshire, the battalion became part of the 59th Brigade, 20 Division along with their sister battalion the 11th KRRC. In April 1915 we see the battalion in Whitley, transferring in April 1915 to Hamilton Camp, near Stonehenge. The Division was inspected by King George V at Knighton Down on 24 June 1915, by which time all equipment had arrived and the Division was judged ready for war. The Battalion sailed for France landing at Boulogne on 21st July 1915. "From shop-man in a local stores at Beeston to a machine gunner on a modern battle field is a big transformation and to go through a series of terrible battles with comparitable slight injuries is another yet remarkable episode in the career of a young man who would have been only 20 years old next month. He had been in France about 2 years when he was killed in action. Private Tonks had taken part in most of the big battles in his sector of the war camps. "He was wounded at Vimy Ridge where he received a shrapnel wound, but after a month in hospital at the base the rifleman was sent back to the front." 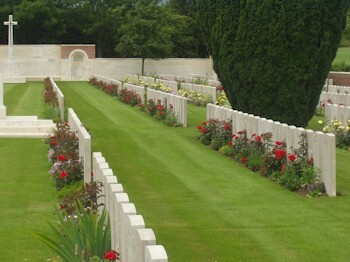 Rifleman Tonks died of wounds on 20th June 1917 and is buried along with 28 others of 10th King’s Royal Rifle Corps in Grevillers British Cemetery. 21901 Census Piece 3153, Folio 109. Half-brother William, age 20, was working as a moulder in the foundry while John (17) and Arthur (14) were working in a cycle works (probably Humbers) as a filer and turner respectively. At the time of Ernest's death, the family were living at 21 Clifton Street, Beeston (the address given in the Commonweath War Graves Commission records). 3He was recorded as number 3475 in the School Admissions Register.